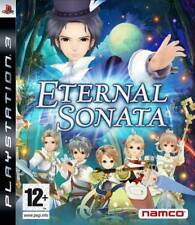 Eternal Sonata. Dispatched within 24 hours. Circus Atari (2600). Bowling (2600). Stunt Cycle (2600). Dodge ‘Em (2600). Only if stated or shown in the picture, as for manuals, most information can be found on the usual web based search engines. Technical Support. 50 classic Atari and arcade titles remastered and bundled on one disc for the PlayStation 4. Circus Atari (2600). -Bowling (2600). -Stunt cycle (2600). -Dodge 'em (2600). Add to collection. -Video Olympics (2600). -Tempest (arcade). -Tempest (2600). 2 NIP PlayStation 4. Atari Flashback classics vol. PlayStation 4. Platform: PlayStation 4. Plattform Sony PlayStation 4. Format PAL (UK Standard). USK-Einstufung USK ab 6. Do not miss anymore! ATARI FLASHBACK CLASSICS VOL. 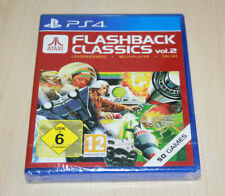 Titolo videogioco ATARI FLASHBACK CLASSICS VOL. Platform:PlayStation 4 | Edition:Classics Collection vol.1. Online Leaderboards: Compare your high scores with players from around the world. We stand fully behind our products. width: 17.2 x height: 13.4 x length: 1.3 x weight: 81.6. Online Leaderboards: Compare your high scores with players from around the world. Air-Sea Battle (2600). Atari video cube (2600). Video Pinball (2600). Add to collection. Race (2600). Sprint (arcade). SpaceWar (2600). Sky Diver (2600). Sentinel (2600). Please read before purchasing the article "Atari Flashback classics vol. 1 PS4 "the full description of the article, to learn more about State & delivery and to avoid Fehlkäufe!. Please read before purchasing the article "Atari Flashback classics vol. 2 PS4 "the full description of the article, to learn more about State & delivery and to avoid Fehlkäufe!. 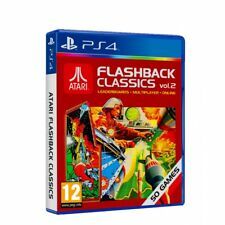 Atari Flashback Classics Collection Vol.1 (PS4) PlayStation 4 . 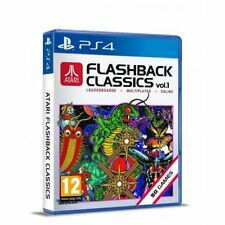 5 out of 5 stars - Atari Flashback Classics Collection Vol.1 (PS4) PlayStation 4 . 1 product rating1 product ratings - Atari Flashback Classics Collection Vol.1 (PS4) PlayStation 4 . Online Leaderboards: Compare your high scores with players from around the world. We're happy to help. Air-Sea Battle (2600). We do not accept P.O. Boxes. 3-D Tic-Tac-Toe (2600).